In contrast to the general belief that the airways of an infant are sterile until after birth, University of Alabama at Birmingham (UAB) researchers and colleagues have found that the infant airway is already colonized with bacteria or bacterial DNA when a baby is born. This is true for infants born as early as 24 weeks gestation, say the scientists. How microbes get into the airways and the purpose of this prebirth colonization are still unclear, but the pattern of colonization appears to have an important link to later severe neonatal lung disease. An early microbial imbalance, or dysbiosis, is predictive for the development of bronchopulmonary dysplasia (BPD), a chronic lung disease of prematurity. The extremely low-birth-weight (ELBW) infants in this study had an average birth weight of 1 pound, 8 ounces. Researchers found that the ELBW infants who went on to develop life-threatening BPD showed abnormal microbial colonization patterns at birth, as compared to preterm infants who did not get BPD. “Right at birth, your respiratory microbiome can possibly predict your risk for BPD,” said Charitharth Vivek Lal, M.D., assistant professor in the UAB Pediatrics Division of Neonatology and the lead investigator of this study. The study also suggests that the “healthy” pattern of colonization seen in the BPD-resistant ELBW infants, with increased abundance of Lactobacillus, is protective. Dr. Lal says this is the first unbiased airway microbiome analysis to be done immediately at birth (all the early saline aspirates from the tracheas of the newborns were collected at or within 6 hours of delivery). It is also the only infant airway microbiome analysis to be validated at a second medical center. After the first group of 23 ELBW infants and 10 full-term infants were studied at the Regional Neonatal Intensive Care Unit, UAB Women & Infants Center, samples from a second group of 14 ELBW infants were studied in collaboration with Vineet Bhandari, M.D., at Drexel University College of Medicine, Philadelphia. About half of the ELBW infants at both sites, all of them extremely preterm, later developed BPD. The differences in the microbiomes between infants who were BPD-resistant and BPD-predisposed were similar for infants in both Birmingham and Philadelphia. Extremely premature infants are at risk for BPD, which is the most common lung pathology of these tiny infants and a significant cause of morbidity, mortality, and health care expenditures. Adults and children who had BPD as infants have lungs that failed to develop properly and are more prone to worse lung function, asthma, lung infections, and pulmonary hypertension. The researchers also looked at the airway microbiomes of 18 ELBW infants with established BPD and found that their microbiomes had a decreased diversity of types of microbes. The pattern was very different from those of ELBW infants shortly after birth or full-term infants at birth. As to specific groups of microbes, the phylum Proteobacteria, which includes bacteria like Escherichia coli, appeared to be involved in BPD pathology, and the genusLactobaccillus, part of the phylum Firmicutes, appeared to be involved in disease protection. Dr. Lal and colleagues found decreased Lactobacillus abundance in the airway microbiomes of 10 infants born to mothers who had chorioamnionitis, an infection of the membranes of the placenta and an independent risk factor for BPD, as well as decreased Lactobacillus abundance at birth in the airways of the BPD-predisposed ELBW infants as compared to BPD-resistant infants. Research elsewhere has suggested a beneficial role for Lactobacillus against airway diseases and for lung development. “I predict that researchers will study the use of respiratory probiotics, and the role of the gut–lung microbiome axis in the future,” Dr. Lal said. 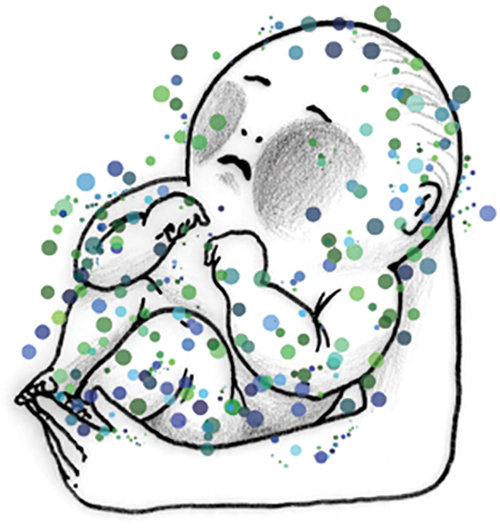 For five ELBW infants who later developed BPD, the researchers collected periodic airway microbiome samples from birth through 9 weeks and saw extremely similar patterns of change in the microbiomes over time. The researchers speculate that this transmission of bacteria or bacterial DNA to the in utero infant could be via blood or amniotic fluid.